Harriet and Dov Kaminetzky were my clients for many years. Dov passed away a few years ago, and his wife more recently. Dov was born in Jerusalem in 1925, and joined the Palmach unit of the Haganah at the age of 14. He fought in the 1948 War of Independence, and was a decorated officer in the IDF. As a couple, the two were dedicated collectors of Holy Land Judaica, dating from both pre- and post-Israeli statehood. Most of the objects that they collected were crafted at the Bezalel School in Jerusalem, in the first quarter of the 20th century. After Dov’s passing, Harriet sold most of the collection — much of it through my auction house. Prized possessions that Dov had for close to 50 years changed hands, sometimes for only the second time in the each object’s’ history. When Harriet passed away, the couple’s children decided to sell the balance of the pieces, holding onto the most prized possession for last: the refugee identification care of Ze’ev Jabotinsky. It was issued by France in 1938, and was valid from January 1, 1939, to January 1, 1942. The document contains Jabotinsky’s iconic picture and his original signature. It indicated his profession as “journalist.” It showed that he was a refugee from Russia and that he was allowed to live in France. Interestingly enough, this card did not permit employment. Ze’ev Jabotinsky was born Vladimir Yevgenyevich Zhabotinsky on October 18, 1880, in Odessa. In his lifetime, he was an author, poet and soldier. He was mostly known for founding the Jewish Self-Defense Organization in Odessa, as well as creating Zionist Revisionism. He was a founder of the Jewish Legion of the British Army during World War I, and the founder of Betar, HaTzhohar and the Irgun. He was ordained as a Member of the Order of the British Empire in 1919. Jabotinsky’s goal in founding the Jewish Self-Defense Organization was to safeguard the Jewish communities of Russia. He learned Hebrew and abandoned his name, Vladimir, to become Ze’ev. In 1903, he was elected as the Russian delegate to the Sixth Zionist Congress, eventually replacing Tbeodor Herzl after Herzl’s passing. During World War I, Jabotinsky led the Jewish Legion, along with Joseph Trumpeldor. In 1920, he was elected to the the First Assembly of Representatives in Palestine, and founded Keren Hayesod — becoming its director of propaganda. He then left the mainstream Zionist movement to create Betar in 1923. In the 1930s, Jabotinsky became deeply concerned with antisemitism in Eastern Europe, and prepared an evacuation plan for Jews to immigrate to Palestine. Jabotinsky passed away of a heart attack in New York in 1940, and was buried in New Montefiore Cemetery. He was reinterred on Mount Herzl in 1964, along with his wife. As a confused observant Jew, I found myself attracted to the Jewish Defense League as a teenager. I found peace in protecting synagogues on Halloween night. I also remember going to East New York and Brownsville with my father a week before Passover to deliver kosher products to shut-ins afraid to leave their homes. 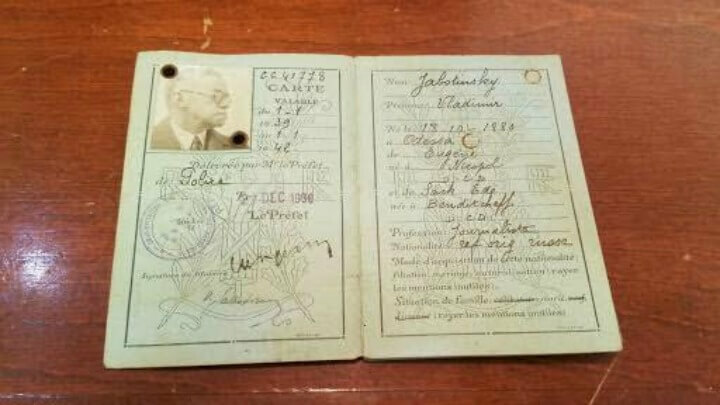 So when I held Jabotinsky’s ID card for the first time, I felt connected to a part of history where Jewish defense was significantly more needed than when I was growing up in 1970s Brooklyn. Jews had the audacity to defend themselves? While Jabotinsky was not the first one to have this idea, he was clearly one of the most influential. I could only imagine his thoughts while in America raising funds for a Jewish homeland. I have had some pretty wonderful things pass through my auction house over the years, and with each piece, I had a different feeling. With each piece, I took away something. With Jabotinsky’s card, I felt the pride of being a strong, proud and Israel-loving Jew.